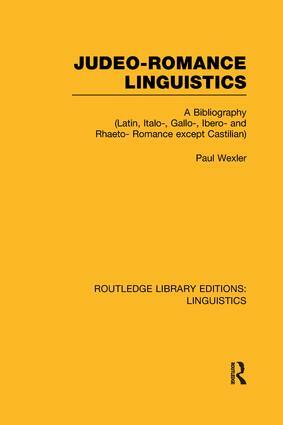 A separate bibliographic treatment of the Judeo-Romance languages should facilitate a deeper appreciation of the contributions that they may make to Romance linguistics in general. Up until now, Judeo-Romance topics have scarcely been canvassed in Romance linguistic bibliographies. It is hoped that this new book serves to popularize the field of Judeo-Romance languages both among students of general Romance and comparative Jewish linguistics.